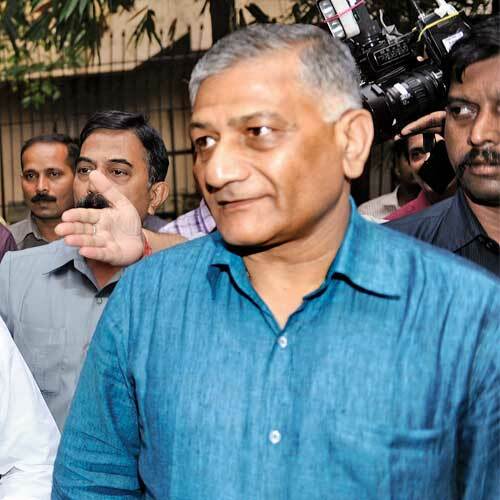 Former Army chief General VK Singh on Monday said the CBI is closing its investigation in the alleged bribery case against retired Lt Gen Tejinder Singh under political pressure. He said this in response to reports that the investigation agency will close the probe due to lack of evidence. In March 2012, Gen VK Singh had said that Lt Gen Tejinder Singh had offered him Rs 14 crore to clear a tranche of 600 Tatra trucks for the army. He also alleged that the offer, made in September 2010, was on behalf of Ravi Rishi, owner of Vectra group. In his statement to the CBI, Lt Gen Tejinder Singh claimed that he met Gen Singh to seek his support for the post of chief of the National Technical Research Organisation (NTRO). According to news reports, General Singh could not provide substantial evidence to show that Lt Gen Tejinder Singh offered him a bribe. However, Gen Singh said that there are enough records to show that Lt Gen Tejinder Singh met him to offer a bribe. “Following which, I wrote to the defence minister and also met him personally,” he added. “I have given the CBI all the notes containing minutes of the meeting with Tejinder Singh. As a practice, I record minutes of all my meetings with senior officials like PMO, defence minister or others for past many years,” said General Singh. These notes should be enough for the CBI to probe the matter, he added. He also denied reports promising to hand over any CD containing conversation between Gen Singh and Lt Gen Tejinder Singh but not doing so despite CBI’s requests. “I had told them (CBI) that there might be some recordings in my office but not for sure. I mentioned this in my complaint also,” he said.